Tula 7.62x39 ammo is widely regarded as one of the top production facilities of Russian ammo for com-bloc weaponry. They come in the iconic black box we all recognize and have plenty of options available. 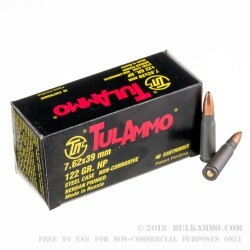 These bulkTulammo 7.62x39 rounds are topped with the 122 grain weight HP bullets. 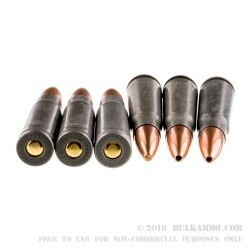 These HP or Hollow Point rounds have a solid lead core, copper jacketed, hollow cavity design to them. 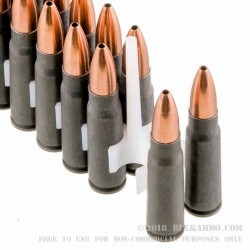 These bullets are loaded into newly made, high quality, non-reloadable, non-corrosive Berdan primed, polymer coated, grey steel cases. These loads fly with an impressive muzzle velocity of 2,396-feet per second, ensuring a heavy hit on the target. The impact of this round is equally impressive and strikes with 1,555-foot pounds of muzzle energy. These cartridges are manufactured in Tula Russia, and each individual case has 1000 rounds packed up in 50 separate boxes of 20 rounds. Each of these 1000 round cases weighs roughly 42 pounds, and they stack easily because of their design. Once you get yourself a few cases for your personal armory, pick up a couple more so you will have plenty of ammo for weeks or shooting range visits and training. Get started today! Q: Are cartridges polymer coated? Q: Is there any steel in these hollow points? 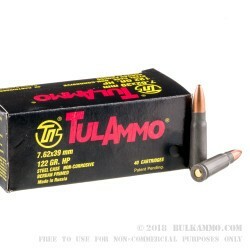 A: Hello Dennis, The Tula 7.62x39 ammunition does have steel in the jacket of the bullet.